Home » Articles » 64. Need Less Medication, Fewer Painkillers and Band-Aids? ← 63. Intuition! How does the MIR-Method foster it? Sunday morning is the time for “home improvement”. Then I do some odd jobs or cleaning up for 2 hours with my husband. Chores that we don’t get to do during the week and don’t feel like doing. Once they’re done, we’re always happy about them. The heater that makes too much noise, the shed that’s full of stuff that can go to the 2nd hand store, hanging up two hooks for the children’s towels. Not new hooks, but hooks that keep on hanging! This Sunday, it was the medicine chest’s turn. We have a nice place for it: the restroom. The chest was overflowing with painkillers, gauze bandages, eye drops, ear drops, creams for sprains and tired legs, Johannes oil for-whatever-it-was-again, and a guide to poisons for when the children drink from the wrong bottle. I took everything out; I wanted to clean the chest and set everything back in. But I noticed to my great surprise that almost everything was over the expiration date! Even the gauze bandages! I didn’t even know that they had an expiration date. I thought: once sterile, always sterile! But no, they’re not! I checked everything and had to throw away more than half of it. 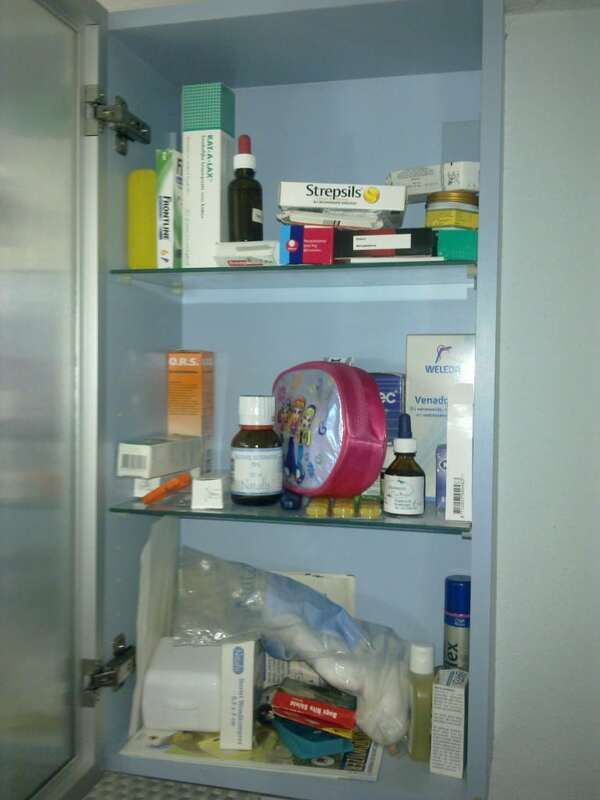 Result: a nicely cleaned-up medicine chest. I put the expired items in a plastic bag and went to the drug store, which also provided me with a good walk. While walking, I realized how healthy we are. We don’t need to use medicines, we use painkillers seldom and one way or another we have often been protected from real medication resulting from cuts or burns. Next Sunday, we’re going to check out the first aid kit in the car! 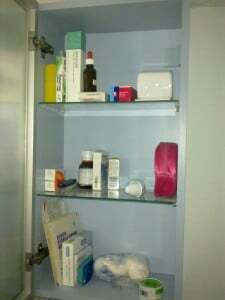 I regularly read reports about people who have got permission from the doctor to use less medication. I also hear that people use fewer painkillers and smear fewer creams. They say that this has come about because of the MIR-Method. 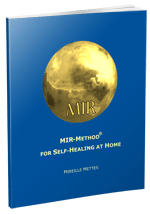 Liesbeth writes: “I started doing the MIR-Method in June and (…) my blood pressure has gone from very high to normal, to even on the low side. 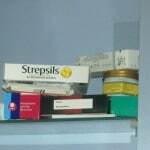 Was able to stop taking certain medications because of this. I’m continuing to do the MIR-Method because I find that I sleep better and wake up more rested”. Click here for Liesbeth’s whole story. That is, of course, very worthwhile information and confirms the working of it. With the MIR-Method, you work on the causes of your problems. You stimulate the self-healing ability of your body. Resolve the causes, and the problems will give in. And you notice this with improved blood values, better skin or less pain. In other words, that you can stop using medication, smear less cream or stop using painkillers. Your concentration and coordination can improve with the MIR-Method. This will make you bump, cut yourself or fall less often! And, are you using less medication, painkillers, creams or band-aids because of the MIR-Method? Please let me know about it below! Thank you! -> Personal questions should be asked of a MIR-Method coach! My wish for you is a medicine chest that you rarely need to use!